My art is a reflection of nature and of the human spirit in that we find the most beautiful and enigmatic objects are those that float above us. Our mind prepares us to be amazed, as we look skyward. 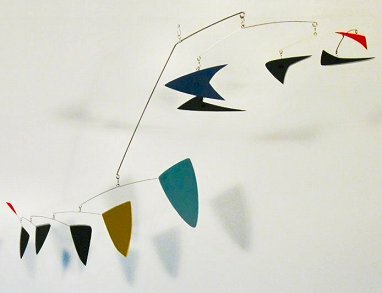 I started making hanging mobiles about 25 years ago after I stumbled upon a book about Alexander Calder in my local library. Like many people, I was only familiar with the type of mobiles that were to be found in a nursery hanging over a baby crib. 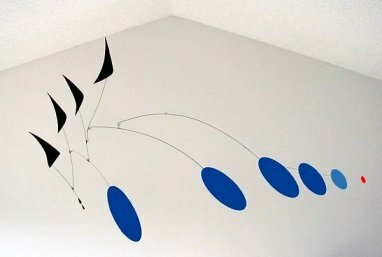 I had no idea that a hanging mobile could be "fine art", or that it was an art form uniquely invented by Calder in the 1930's and developed into fantastic levels of beauty and complexity over the next 40 years of his life. I was stunned by the pictures in that book. The abstract yet organic polymorphic shapes and unbelievable creativity that Calder used in the evolution of his designs amazed me, and the artistic combination of playfulness, abstraction, and engineering instantly captivated me. I had to have a hanging mobile of my own! I studied photographs of Calder's work and searched for more information in libraries about hanging mobiles and how to construct them. About a week later, my first mobile, a contraption made from coat hangers and poster board, was hanging over my bed. I was hooked. Twenty-five years later, I am still making hanging mobiles and I still get the same thrill when I hang one up and "set it free" for the first time. They are truly a unique form of art that can be appreciated by young and old. I hope you enjoy my art! Please feel free to email me with any questions or comments that you might have. Thanks again for visiting "The Mobile Factory"! Thank you for visiting The Mobile Factory! All of my hanging mobiles are hand made to order, and are carefully constructed of the highest quality materials. Each one is unique in its own way, and is signed and dated as a work of art. These beautiful kinetic sculptures can add an elegant accent and a hint of playfulness to that special space in your home or office. I have a range of designs and sizes to compliment nearly any size space and decor. Atriums, vaulted ceilings, multi-floor foyers, and	large office spaces are perfect for my larger sized hanging mobile sculptures, but there are plenty of smaller designs to choose from if you don't have much room. Keep in mind that all of these designs can be enlarged or reduced, often without any change in price. You can order one of my original hanging mobile or stabile designs showcased in the galleries, or commission a custom hanging mobile or stabile based on your own specific design requirements. Refer to the "Ordering & Information" page and/or contact me for more details regarding custom commissions. 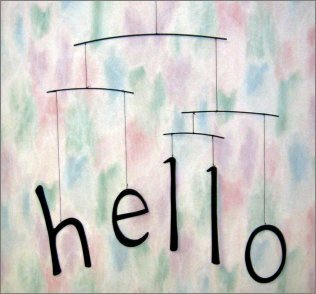 Check out my Hanging Mobile gallery, and be sure to also check out my Stabiles (table-top hanging mobiles) and visit the "Commissions" page for examples of custom mobiles that I have specially designed for clients. Send me an email if you are curious or see something of interest, and I'll be happy to send you a price list. 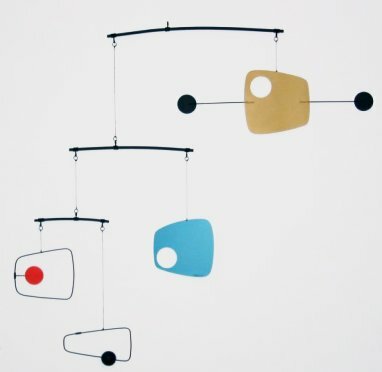 CHECK OUT MY NEW MOBILES IN THE HANGING MOBILE GALLERY! Email me for a complete price list! Click here to take the Alexander Calder Trivia Challenge! Learn how to make a hanging mobile!